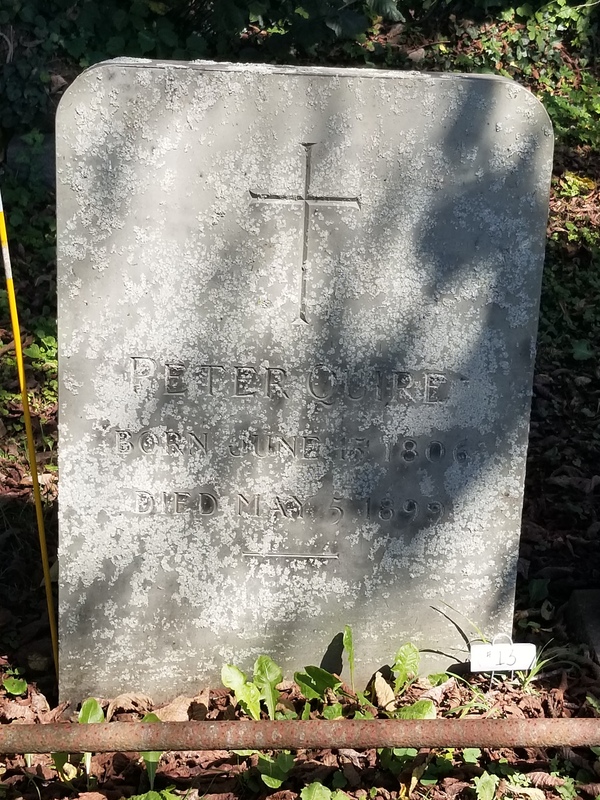 Featured Image: Grave of Peter Quire (1806-1899), the Lay Founder and first Benefactor of the Zabriskie Memorial Church of Saint John the Evangelist in Newport, Rhode Island, in “God’s Little Acre,” the historic African-American section of Newport’s Island Cemetery. Collect: O God, forasmuch as without Thee we are not able to please Thee, mercifully grant that Thy Holy Spirit may in all things rule our hearts; through Jesus Christ our Lord, who with Thee and the same Spirit liveth and reigneth, one God, now and for ever. Amen. How good and wonderful it is to be with you all, the People, Neighbors, and Friends of Saint John’s. My many thanks to your Rector for his invitation to preach the Gospel [and celebrate the Mass] and bringing about this opportunity to meet new friends. And that is just how I see you, despite us not knowing each other long—friends—for as it says in Proverbs, “The rich and poor…together: the Lord is the Maker of them all.” (Proverbs 22.2) So, dear friends, thank you for your welcome of me, a sinner saved by grace and a fellow disciple of Jesus, the Christ. And it is precisely that, “Thou art the Christ,” (Mark 8.29) Jesus’ very nature, that Peter today confesses in the Gospel. Jesus now asks us, “Whom say ye that I am?” (Mark 8.29). If we, too, believe Jesus to be the Christ, are we willing to do what He says: “Whosoever will come after Me, let him deny Himself, and take up his cross, and follow Me.” (Mark 8.34) Are we willing to follow Jesus to Calvary? Yet, just as the cross was offensive in Jesus’ day, in our own do many have misgivings about “taking up the cross” and following Jesus. Some hear the Bible’s stories and think them not logical. Others want to believe God is good, but when bad things keep happening, either to them or throughout the world, they wonder, “If God is good, then why does this stuff keep happening?” For many, Jesus’ words are hard to believe. And what we ourselves have not seen, faith helps us to believe. It was 143 years ago that another Peter, a black cobbler named Peter Quire, offered a Priest and a group of young men the use of his Newport Third Street home for missionary work and today on his faith in and confession of Christ this magnificent building stands. Peter Quire is just one of the many saints known and unknown throughout history who were so changed by God that their lives are now for us examples of Christian holiness and gratitude. To the fullest they “toiled and fought and lived and died for the Lord they loved and knew.” They were not perfect people by any means but model how to live Christian lives in a broken world. God’s saints were and are regular people like us and their faith in Jesus is encouragement for us to also believe Him and be saints. From the cross comes the good news that all who believe in Jesus and confess His Name shall not perish but have everlasting life. That is why Jesus speaks of God’s Kingdom over and over again. Its glory surpasses all parabolic descriptions that He doesn’t want whatever misgivings we have of the cross to cause us to miss out on it. We have no need to fear the cross, for Jesus Himself overcame it, death, and the grave and by His glorious resurrection has opened to us the way of everlasting life. On the cross was God’s true love for all the world’s people on full display. Only through the cross and Christ’s love can we endure the trials of our own lives and conquer oppression. Paul says it best: the way of the cross helps us “beareth all things…hopeth all things, endureth all things.” (1 Corinthians 13.7) Thus, by following the way of the cross, forsaking our wills in favor of God’s, we become our best selves and, through grace, go from being spiritually poor to eternally rich. Therefore, we should embrace the cross, for Jesus’ victory on it proves His love is stronger than death. His victory gives us courage to know that we have been given the strength to “wrestle…against principalities, against powers, against the rulers of darkness of this world, against spiritual wickedness in high places.” (Ephesians 6.12) Jesus showed on Calvary the extent to which God will go to prove His love for you. “Greater love hath no man than this, that a man lay down his life for his friends. Ye are My friends, if ye do whatsoever I command you.” (John 15.13-14) What does Jesus command? “Love one another, as I have loved you.” (John 13.34) To walk the way of the cross, the way of Christ, is to really live, not just on Earth, but forevermore with Christ in Heaven. When I was a younger boy, I remember every time my antics would drive my mother close to the edge, she always shouted, “Jesus, keep me near the cross! Keep me near it!” We should all want to be near the cross, seek after it, and live its way. For in the cross and love of Jesus Christ is real life and hope, full redemption and release, and the courage and power to face our troubles. Only at 10:00am High Mass. “More Young People Are Moving Away from Religion. But Why?” NPR (https://www.npr.org/2013/01/15/169342349/more-young-people-are-moving-away-from-religion-but-why), Web. Accessed September 12, 2018. James Merolla. “St. John the Evangelist—The Legacy of Peter Quire: Black Cobbler Founded Point’s Landmark Church in His Home,” Newport This Week (September 3, 2015), p. 22. “I Sing a Song of the Saints of God,” words by Lesbia Scott (1898-1986). Cyril of Jerusalem was a distinguished Christian the0logian who lived from c. AD 313-386. Philip Schaff and Henry Wace, ed. The Nicene and Post-Nicene Fathers of the Christian Church (Volume VII: S. Cyril of Jerusalem; S. Gregory of Nazianzen) (Wm. B. Eerdmans Publishing Company, 1978), p. 92.